Typically kids werewolf costumes have been geared towards little boys. 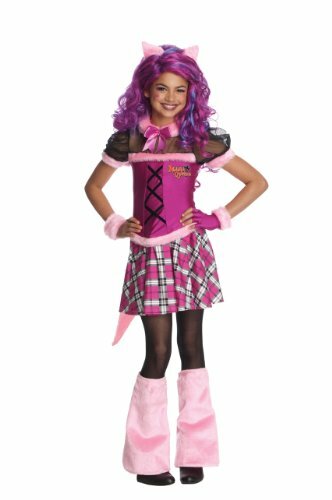 With the success of Monster High and the Clawdeen wolf character there are now many great werewolf costumes for girls available. These costumes are fun, colorful and add a feminine flair to an otherwise male dominated genre. With a fashionista werewolf costume your little girl can embrace both her beauty and her power. 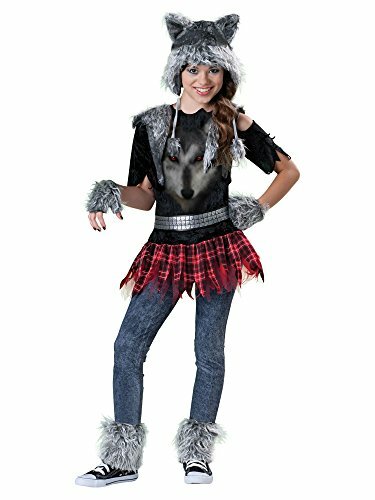 This girls wolf costume by InCharacter Costumes is a fun play on words. Wear wolf, werewolf. The Wear Wolf was a very popular costume for Halloween 2012 selling out weeks in advance. The costume includes a black shirt with a wolf print on it and a red plaid ragged edge skirt. For extra werewolf appeal there is a black and grey faux fur vest with torn sleeves, furry glovettes and boot covers. A faux fur hood with ears and ties with pompoms completes the look. Your little fashionista can decide whether to wear her jeans or leggings with the costume. The costume comes in a range of sizes from small (6) to 12 - 14. Monster High's Clawdeen wolf is the trendsetting queen of fashion. She is beautiful, loyal to her friends and does everything with complete confidence. No wonder girls want to dress up as Clawdeen for Halloween. 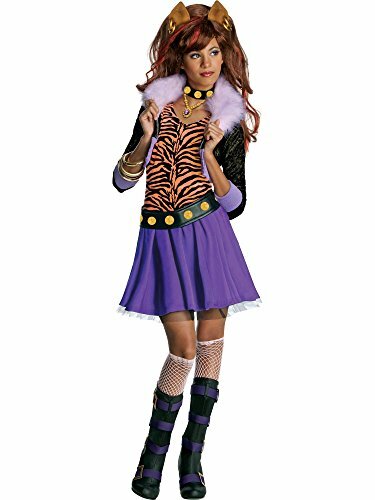 This werewolf costume comes with Clawdeen's pink tiger stripe shirt, an attached black sparkly jacket accented with lilac cuffs, hem and faux fur collar, a purple layered skirt with belt and a black choker with yellow designs. Boots, knee highs and bangles are not included. You can either style your daughter's hair or Clawdeen's brown and red wig with pierced wolf ears can be purchased separately. Based on customer reviews the costume does tend to run on the smaller side so if in doubt order the next size up. Some customers have been thoroughly satisfied with the coverage of the skirt while others have found it to be too short. If you watch the video review below the skirt appears to be of a decent length, but if your daughter is tall then it may seem a bit short. One of the easiest ways to counteract a short skirt is to add a pair of opaque tights such as these purple and black striped tights. This way the costume is toned down a notch yet the fun fashionable vibe is retained. Poll: What do you think of fashionista werewolf costumes? They are a fun idea! The Drama Queens Wild Thang costume by Rubie's Costume Company is a glamorous and very feminine werewolf costume for girls. If your little monster likes pink then this is a great costume option. The outfit includes a pink dress with plaid skirt, faux lace-up bodice and pink fur trim along the collar, sleeves and top and bottom of the bodice. A pink tail is attached to the skirt. The costume is very fashion forward with one pink fingerless glove and a pink fur cuff for the other hand, and a pair of matching pink fur boot covers. Tights and shoes not included. Available in small (4 - 6), medium (8 - 10) and large (12) sizes. If you like the look of the purple wig with pink ears, it can be purchased separately. The 'Howlette' werewolf costume for girls proves you can be scary and fashionable at the same time. This trendy wolf costume includes a black lace dress with a tattered hemline. Red fabric shines through the claw marks on the sleeves and the skirt. What really makes this costume stand out are the gorgeous over-sized furry boot covers, glovettes and headband. The red fishnet tights must be bought separately. To finish the look apply grey eye shadow for a smoky eye look and use lipstick to create a streak of blood running down from the mouth. I'll bet we see a lot of these costumes this coming Halloween. I love the Clawdeen Wolf costume. I'm a doll collector and she is my favorite Monster High doll.